Electronics could work faster if they could read and write data at terahertz frequency, rather than at a few gigahertz. Creating such devices would be eased with materials that can undergo a huge change in how easily they conducted electricity in response to a magnetic field at room temperature. 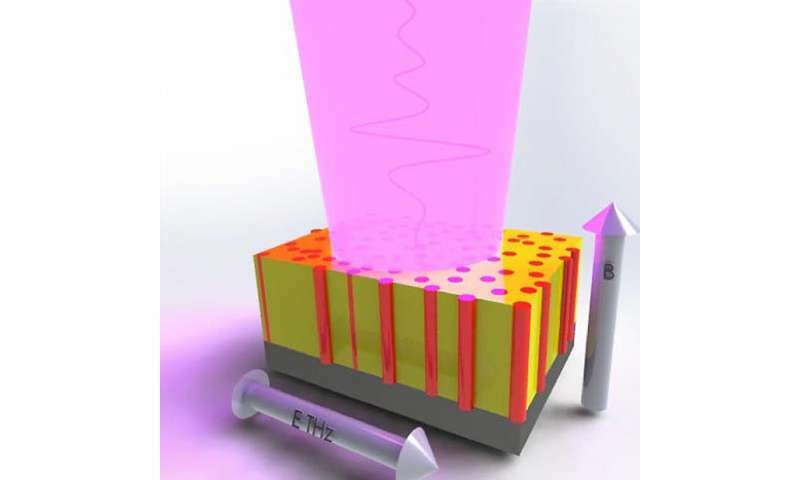 Scientists believe thin films of perovskite oxides hold promise for such uses. However, such behavior has never been seen at these frequencies in these films. Until now. Via terahertz pulses, scientists at Center for Integrated Nanotechnologies and the United Kingdom discovered colossal changes in electricity's flow at the desired frequencies and temperature. In the designer composites, electrical conductivity can be controlled by both an applied magnetic field and temperature. The team's work highlights a new approach to control conductivity in these thin films. Such materials might revolutionize the design of memory devices. Can we build novel memory devices to do data reading and writing at terahertz frequencies so that our personal devices can operate at a much higher speed? A team of researchers from the Center for Integrated Nanotechnologies and universities in the United Kingdom found a colossal magnetoresistance at terahertz frequencies at room temperature in high-quality functional nanocomposites. The terahertz conductivity of nanocomposites can be controlled by both an applied magnetic field and temperature. For example, in the presence of an external field (for example, 2 terahertz), the terahertz conductivity changes over two orders of magnitude. These findings demonstrated a new approach of utilizing optic pulses at terahertz frequencies to probe magnetoresistance, which can revolutionize the design of future memory devices. Different from conventional colossal magnetoresistance observed at high magnetic fields and low temperatures, this newly developed colossal magnetoresistance at terahertz frequencies can be seen at room temperature and intermediate magnetic fields. The team studied the underlying physical mechanisms with terahertz time-domain magnetospectroscopy. Researchers can use the results to guide the future development of novel functional thin films with better performance. The experiments show that colossal magnetoresistance at terahertz frequencies may be used in extremely small electronics and in terahertz optical components controlled by magnetic fields. The research suggests the promise of this material system for future terahertz optical and electronic components, such as magnetically driven modulators.